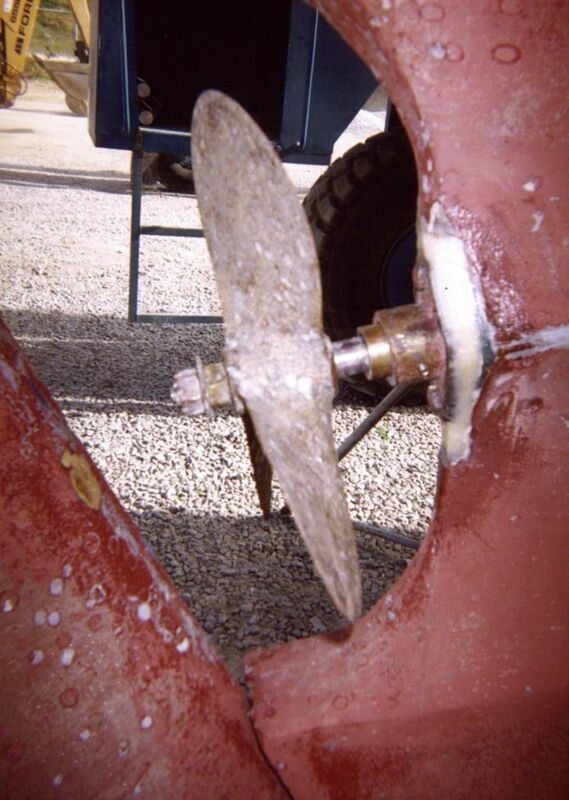 I knew that my cutlass bearing was gone (jump over the side, grab the prop and give it a little shake – if it rattles the cutlass bearing is worn). I managed to ignore it for almost a year. Finally, as I had to do an out of the water survey I decided to tackle it. If your setup is totally different or I have offended anyone with incorrect terminology etc. just e-mail me the correction, I will post an attachment. The shaft on a DE38 will not come out backwards. The rudder is in the way. If your boat is set up differently – happy days. Never mind, all is not lost. If it won’t go back it has to go forward – removing the transmission should give you enough distance. 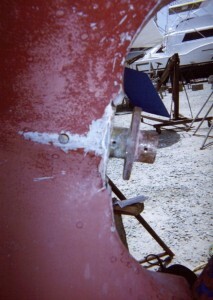 If you need to remove the shaft entirely you will have to drop the rudder (see Walt Smith for advice) or lift the engine. 1. In most cases you will not have to remove the shaft. Remove the transmission, and the move the shaft forward until it is clear of the cutlass bearing (after removing the prop of course). 2. 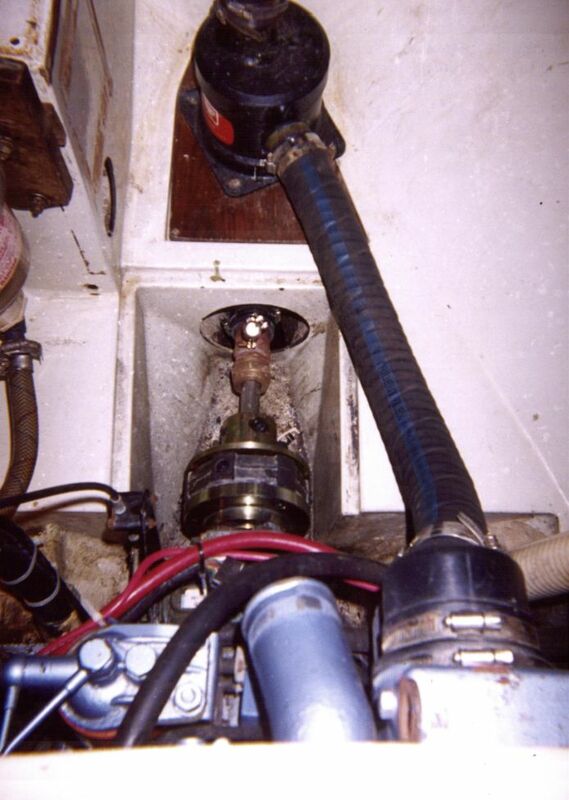 Once you have moved the shaft forward you will be faced with a bronze stern tube held onto the hull by two lag bolts and a lot of 5200 or similar. Let this alone, its a lovely piece of solid engineering. 3. Out of this you will see about 1/2 inch of the cutlass bearing. You will also notice a grub (set) screw on the port side – remove this. 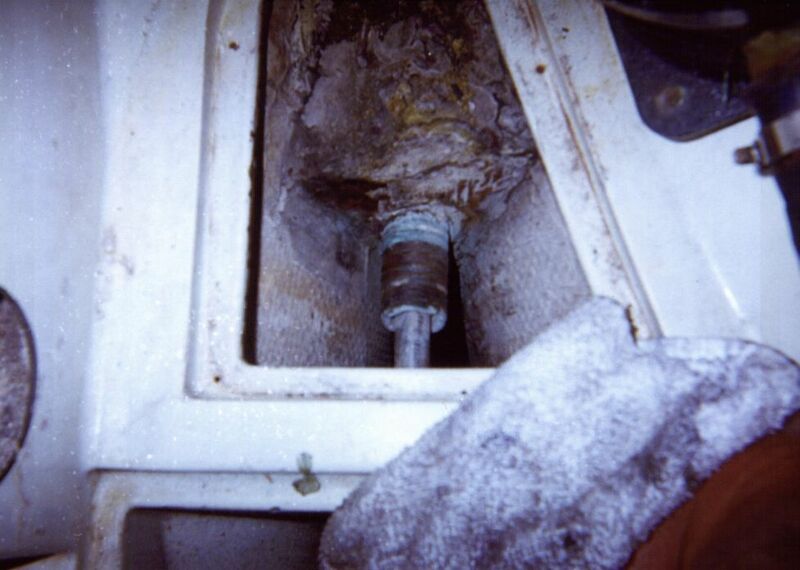 Exactly 2 ins forward of this grub screw (on the same side) is another one, hidden under the fiberglass. 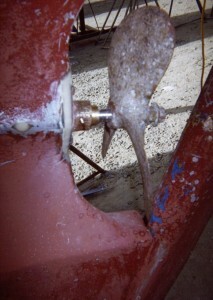 You can either move the whole stern tube back or drill through the fiberglass (I recommend drilling). Remove the second screw. 4. 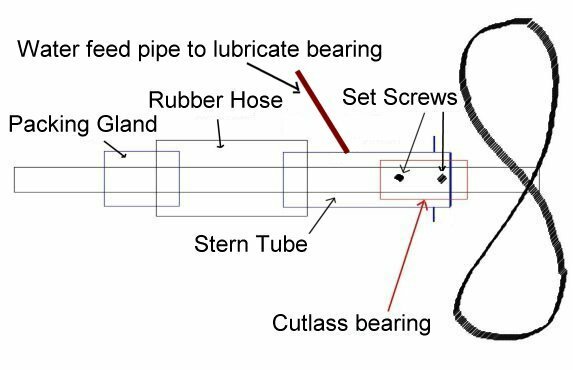 If you are lucky the cutlass bearing will twist out, if not, you will have to hacksaw through it – longitudinally – and then collapse it with a hammer and punch. Clean up the tube. 5. 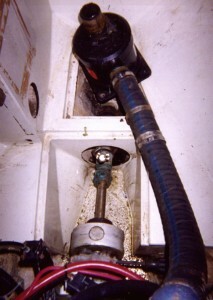 While you are there you may as well replace the rubber hose on the stern gland and replace the flax packing. 6. 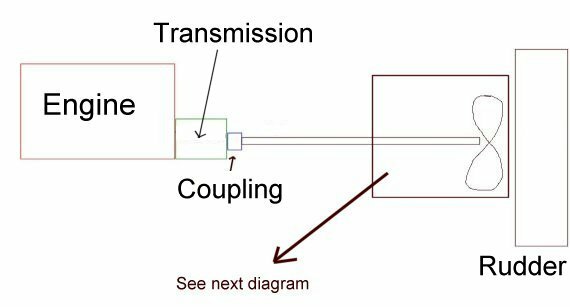 This will require the removal of the shaft coupling (depending on your setup) and it may be hard or easy depending on who installed the coupling it the first place. On Eriu the previous engineers had ignored any mention of an anti-seizing oil and succeeded it having the whole thing so frozen we had to cut it off. I replaced it with a VETUS Bullflex coupling flexible shaft coupler, which seems to do the trick. 7. 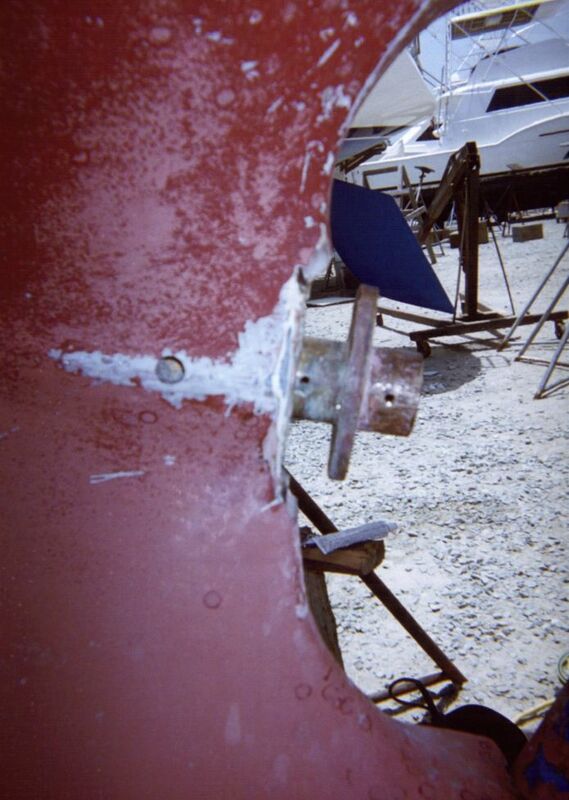 Move the shaft right aft until the end touches the rudder, remove the S/S clips on the stern seal and remove the hose and the front of the stern gland. 8. 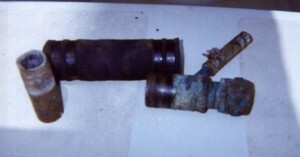 Clean up the bronze bit and replace the hose. Dig out the old packing from the cap, you should have at least 4 turns in there. 9. 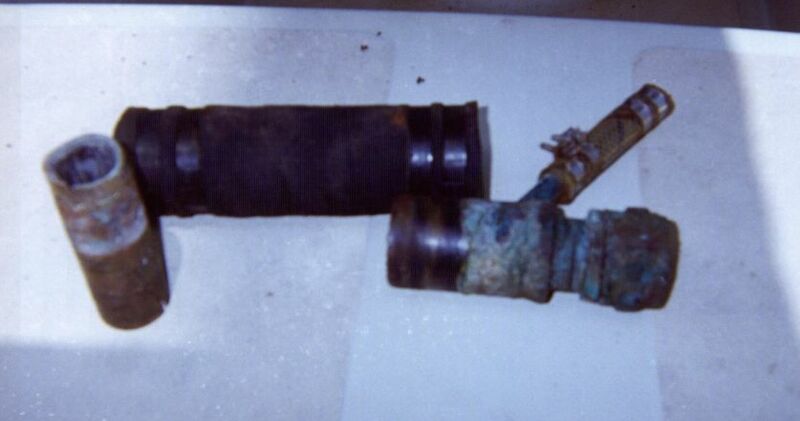 Clean out the water feed pipe, used for lubricating the cutlass bearing. Mine had been blocked off by the previous owner, which contributed to the wear on the cutlass bearing. 10. When fitting the new cutlass bearing my recommendation is to ignore the hidden grub (set) screw and drill and tap a new one in the exposed end of the stern tube, directly opposite the existing one. 11. Fit the new cutlass bearing, well greased with silicone, drill indentations for the set screw and screw them in with thread lock. 12. Refit the stern gland, rubber hose etc, using two high quality S/S rings on each end. Repack with packing. Reconnect the water feed pipe. Reinstall the coupling and transmission, connect everything up. Glass over hole for old grub screw, fair up any damage. Job done! My surveyor thought the whole setup was a lovely piece of engineering (except for the fact that the shaft would not pass the rudder). Having worked on it I have total confidence in its structural integrity. I also now feel that I could replace the cutlass bearing in the water, if I had to. Prop info: Eriu’s prop is a 16 X 11 Right Hand, three blade. Engine is a Permins Perama 35HP, with a Hurth HBW 100 transmission. 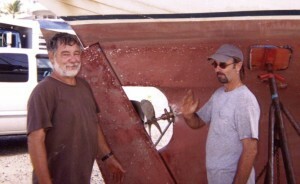 In reality the above mentioned project was carried out by Steve with advice from Fred. My involvement consisted of writing cheques and acting as gofor. Still I will be able to do it next time!! !